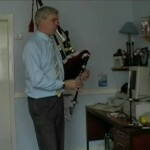 Bagpiper Robert R Pinkman, was born in Edinburgh in 1954 into a piping family, although he did not know this until he was about eight years old. 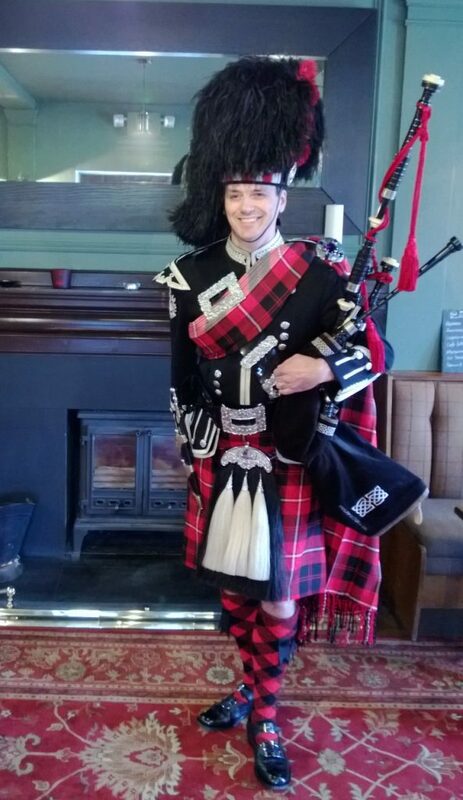 The reason for this was his father, the renowned Pipe Major Archie Pinkman, Bilston Glen Pipe Band, was forced to play by his tyrannical grandmother. When she died, he gave up playing but was soon persuaded to take the pipes up again as he was too much of a talent to lose. Robert was hypnotised listening to his father practice and soon, he was on the chanter, being taught by his uncle Bert, a previous Pipe Major himself. Before long Robert graduated into the band and began what was to become a way of life. Competing with the band and as a solo-ist took up a lot of time and practice sessions would last up to four hours daily. The more he practised the better he became and the prizes got bigger and more numerous. 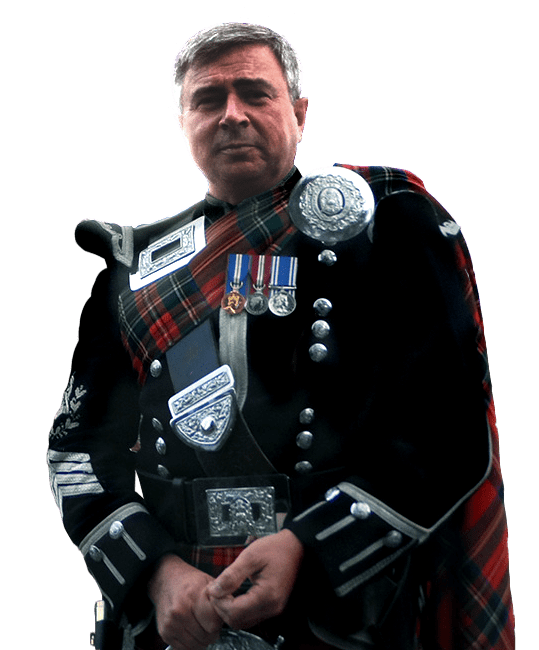 Robert became Pipe Major of The Lothians and Borders Fire Brigade Pipe Band in 1982 and they were soon winning the top prizes in grade two. They were tipped for the top when the government funding was withdrawn and the band folded. Robert has since played with various bands but it is not quite the same as having his own band. In 1994, Robert joined a celtic rock band and played all over the world with them. He left the band in 1999 to pursue other ventures. 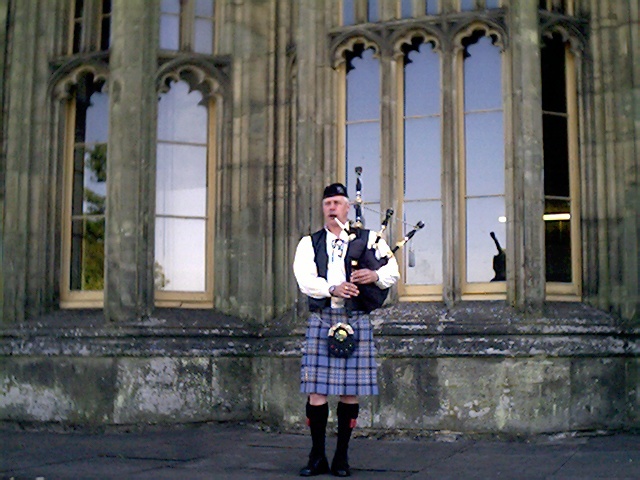 and continued to play at weddings, parties, funerals, etc as well as Burns suppers and special functions all over the world, from China to South America and all places in between. 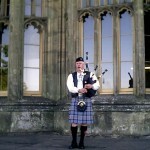 Robert now lives in West Wales and he is continually asked to play at weddings and funerals. 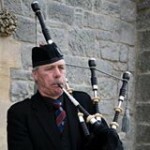 His pipes are always ready to go at a moments notice, and he is prepared to travel great distances to play because of the rural conditions in West Wales. The whole of Wales, Western England, Southern England are quite easy to access areas. Robert will travel abroad for the right opportunity or client who is reliable. He is dependable, smartly dressed in formal highland wear for either day or evening. 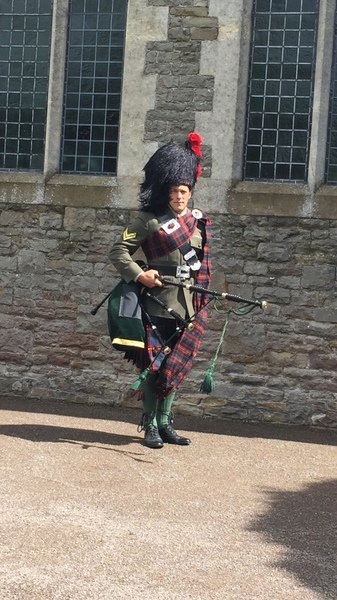 He does not wear the full highland uniform as he feels it's a bit outdated, uncomfortable and takes ages to dress.